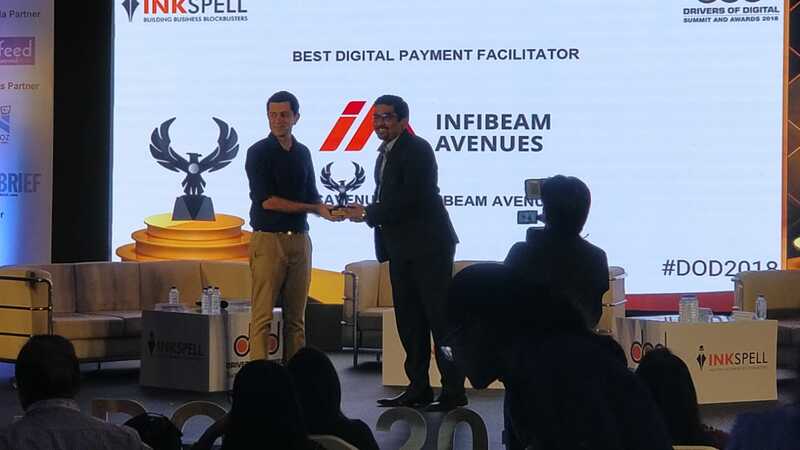 Gandhinagar, 7th December 2018: Infibeam Avenues’ payment gateway, CCAvenue.com, and bill payment platform, BillAvenue, received an award at Drivers of Digital Summit 2018 presented by INKSPELL on 6th December 2018 in Mumbai. CCAvenue.com has won several accolades at other prestigious events through the years. These accolades include ‘The Best Digital Payment Facilitator’ Award twice in a row from IAMAI, ‘Best eCommerce Payment Innovation’ twice at Franchisee India’s eRetail Awards, 'Digital Innovations in the SMB Sector' from Cisco & CNBC-TV18, and 'Best Innovation in Payments & Transfers' at the MoneyTech Awards and more. Within a brief span of time since its launch in 2017, BillAvenue has become India's fastest growing unified inter-operable online bill payments platform. Built on the Bharat BillPay (BBPS) infrastructure, BillAvenue has made utility bill payments an easily accomplish-able task for millions of consumers across the country. CCAvenue is a PCI DSS 3.2 compliant payment gateway platform and is India’s largest direct debit engine, with 240+ payment options connecting to 55+ Indian banks on a real-time basis to process payments through Net Banking and also processes all types of credit cards, debit cards, digital wallet, UPI payments and also offers the highest number of EMI options. CCAvenue has more than 100,000 merchants using its cutting-edge payments platform. CCAvenue payments platform is used by more than 70% of India’s e-Merchants. More than 90 of the top 100 e-Merchants in India use CCAvenue payment platform for processing an online payment. The Company can process transactions in 27 currencies and has multi-lingual capabilities supporting Indian languages including Hindi, Tamil, Marathi, Gujarati, and international languages including Arabic, Spanish, German, Chinese, Japanese, among others. CCAvenue’s payment gateway platform is also used by merchants in the Middle East market. BiIIAvenue is an inter-operable digital bill payments platform built over the Bharat BillPay (BBPS) infrastructure. BillAvenue enables service providers to accept bill payments from customers nationwide, while also offering easily accessible bill payment facility to customers, both online and offline. BillAvenue currently covers payments for utility services such as gas, water, electricity, mobile postpaid, DTH and broadband. Gradually, this scope will be expanded to include several other types of payments including credit cards, insurance, education and admission fees, club fees, taxes, B2B invoicing, etc. BillAvenue currently has more than 100 billers live on its platform and has on-boarded 350,000+ agents who can be approached at their point-of-contact for instant bill payments. Infibeam Avenues is India’s leading payment and e-commerce solutions provider to businesses and the government. It is the only profitable and publicly-listed e-commerce company in India. Its two main offerings are: E-commerce Solutions via the brand BuildaBazaar, an end-to-end SaaS (software as a service) solution that allows merchants to set up an online store, manage the back-end (orders, inventory, logistics), marketing, integrate with marketplaces and accept payments; and Payment Solutions via the brand CCAvenue, which is one of India’s most trusted online payment gateways, providing payment solutions to an estimated over 70% of India’s e-merchants. The Company has over 500,000 merchants across its web services (e-commerce solutions and payment solutions) offerings, including reputed brands such as Amul, Adani, Nilkamal @Home, Saudi Telecom, Jumbo Electronics, Spykar, Esbeda, Panasonic, Blackberry, EsselWorld, Imagica, Idea Cellular, Emaar, Government of India, Taj Hotels, Oberoi Hotels, ITC Hotels, Hilton, MakeMyTrip, ClearTrip, Shopclues, Myntra, McDonalds, Starbucks, Airtel, DishTV, Go Daddy, BookMyShow, Vistara, Indigo, Vivo, GAIL gas, among many others. Infibeam Avenues also owns and operates a multi-category consumer e-commerce website Infibeam.com, strategic to its E-Commerce Solutions offering.